171 people in our community are currently praying with you. And you rise me when I fall. You are there when I most need you. You are there so constantly. You are always there for me. Just to keep me standing tall. And I know I’m Heaven-blessed. Blessed are you, Lord God: Blessed are you for ever. Holy is your name: Blessed are you for ever. Great is your mercy for your people. In the morning I cry out to you: Blessed are you for ever. Father, Son, and Holy Spirit, I praise you and give you glory: I bless you for calling me to be one of your holy people. Remain in my heart, and guide me in my love and service all of this day. Help me to shine your light before others and lead them to the way of faith. Holy Trinity of love, I praise you now and for ever. Oh God my Father, who has always loved and protected your universal church, I pray that your Holy Spirit may fall upon all ministers, priests, pastors, bishops, and all who lead in churches; and upon all teachers of your holy Word. Make them good and faithful stewards of your Holy Word, dear Lord. Bless them to lead us closer to you every day. Let them not be hypocrites in their actions, nor blinded by their personal bias to the truth of your teaching. Let them be strong against the pressures of the secular world, without compromise. Let them always strive for unity with all Christians, not pridefully dividing themselves from one another by the fallible doctrines of man. Raise them up, to peace and love and utter humility, that by their example your flock may be guided into the way of truth. May the Passion of Christ be ever in my heart. May your law and your goodness guide my every thought, O Lord. And may the power of your Holy Spirit flow through my words and my actions today, and always. The Annunciation (detail), fresco by Jacopo Pontormo ca. 1528. 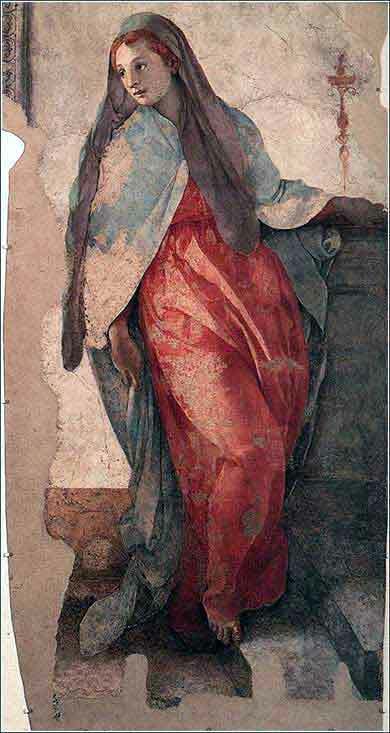 Pontormo emphasizes Mary's humanity and intelligence, rather than her innocence. What you are is God's gift to you; what you become is your gift to God. You blind men! For which is greater, the gift or the altar that makes the gift sacred? So whoever swears by the altar swears by it and by everything on it. And whoever swears by the temple swears by it and by him who dwells in it. And whoever swears by heaven swears by the throne of God and by him who sits upon it. 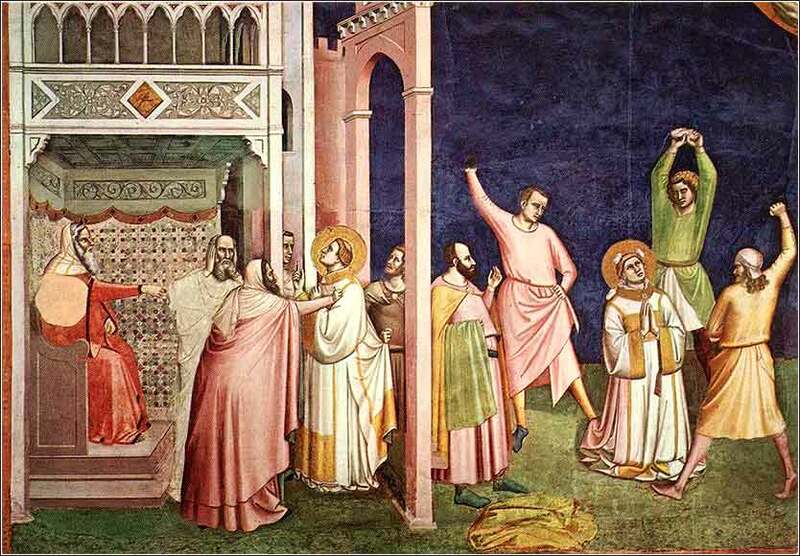 The tone of Jesus's diatribe against the Pharisees is clear: they are hypocrites and they are headed for hell. The specifics, on the other hand, are difficult to follow and need some explanation. 1) There were a considerable number of people in the Mediterranean from polytheistic cultures who were called by God. They had “ears to hear”; they were thirsty for monotheism, and Judaism was the only developed monotheistic religion. Judaism was, in fact, the religion of the one true God prior to Christ. These Gentiles would go to synagogues to learn and worship. One must think that God loved this characteristic of Judaism. It effectively created a Gentile population ready to receive Christ. The problem is that the Pharisees would work on these people to convince them to be circumcised and join the Pharisees in their false, rigid adherence to a body of manmade rules. In effect, they would take a person who was seeking God and divert him into a cult of hypocrisy. 2) The confusing business about swearing on an altar as opposed to swearing on the gift that is on an altar, which makes zero sense to us, is something we have seen before. (Matthew 5:33-37) First off, it shows just how minutely legalistic the Pharisees' religion was. They taught that a person who swore by the Temple did not make a binding oath, whereas a person who swore by the gold of the Temple did make a binding oath! The legalism of this — that is, teaching that righteousness before God depended on such tiny and meaningless details — was false and unholy, in and of itself. But even worse, it was abused to break the law of Moses. Pharisee merchants would swear an oath that something was genuine, but leave some tiny technical detail out in order to cheat people! They might swear “by the Temple” that something was solid silver, when it was silver-plated copper, and laugh up their sleeve because the oath was worthless. They were not only stealing by fraud, but also using the law of Moses to help them do it. 3) Jews were obligated to give a tithe of all crops to the Temple. The Pharisees were so incredibly meticulous about following this law to the letter that, if they grew a small herb garden with a mint plant in it, they would break off a stem of mint as part of their sacrifice. Having complied with such meaningless minuteae of their rules, they neglected the great duties of justice, mercy, and faith. A parallel to modern times will flesh out this criticism. Imagine a deacon in a local church who makes $873.70 in his paycheck, carefully counting out pennies so that he puts precisely $87.37 in the collection plate on Sunday. He then goes home, peers over the backyard fence to lust over his neighbor's teenage daughter sunning in her swimsuit, gets into a shouting match with another neighbor and calls him a “god-damned idiot”, and thinks up a way to hide a mechanical defect in a car he wants to sell. That is what Jesus is talking about, in the “tithe mint and dill and cumin” criticism. Jesus used the metaphor “straining out a gnat and swallowing a camel.” This is a hyperbole, or an intentionally overstated metaphor. If it doesn't quite make sense, think of a person eating a bowl of soup, who strains out a tiny insect but ignores a dead rat in the bottom of the bowl. Jude 1:17-18: Remember the words which were spoken before by the apostles of our Lord Jesus Christ: how they told you that there would be mockers in the last time who would walk according to their own ungodly lusts.